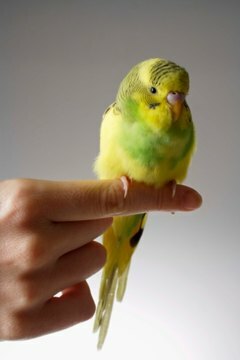 Parakeets, like most pet birds, must be kept warm in the winter time to avoid serious health risks. Birds make great pets and take up less room than more common pets like cats and dogs. Parakeets can live between 10 and 14 years if kept for properly in a temperature-controlled environment. Blankets, heat lamps and heated perches can all aid in providing a safe environment for a parakeet to live in. Keep your house warm. During the winter, the temperature outside the home can drop dramatically so it is important to keep your parakeet inside and warm to ensure its survival. Keep the house temperature at a minimum temperature of 70 degrees. You can use your home's thermostat to adjust the inside temperature. Place a blanket over the parakeet's cage to lock in heat. Install a heating lamp near the parakeet's cage. Make sure that the lamp does not over-heat the parakeet. Place the lamp close enough that it provides heat, but not so close that it injures the bird. A good distance to start placing the heat lamp is 12 inches from the edge of the cage. If you see that your parakeet is uncomfortable, move the lamp farther back. Purchase and install a thermo-perch. A thermo-perch will heat your parakeet's feet which in turn will heat the bird. Your parakeet can stand on the thermo-perch anytime it wishes to warm itself.